Brand Claims- Smokey or colourful, get your favourite style of eye makeup with 'Romantic Efflorosence Eyeshadow Palette ' which comes from MUA makeup academy. The colour palette of twelve colours gives you the freedom of going solo or blending colours to create different effects. The super rich formula blends on your skin in just one stroke and stays for hours. Texture - The texture of the MUA Romantic Efflorsence Palette is quite soft and smooth. The shades blend easily. There is also not so much fall out even in the shimmery shades. Colours also don't crease when applied over a good eye primer or eyeshadow base. I have swatched only one swipe to show the pigmentation of each colour. 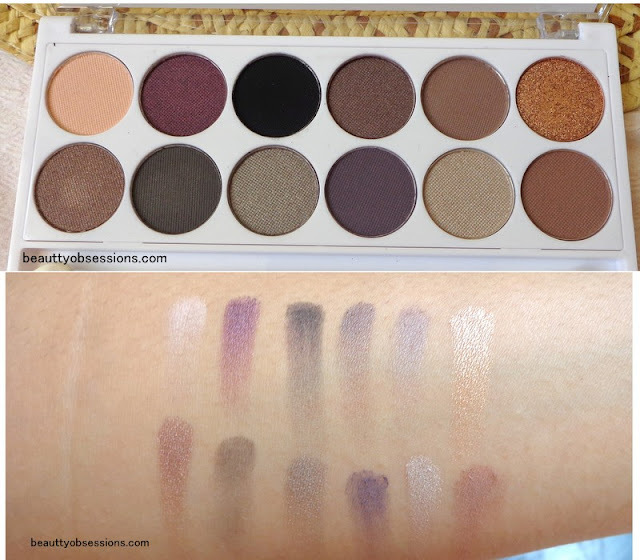 Pigmentation And Staying Power - Pigmentation wise the colours of MUA Romantic efflorosence palette is not good... The darker shades has good coverage but the shimmery and lighter shades require much efforts to pop out properly. Sometimes I use wet brushes to bring desire pigmentation. As the shades are not much pigmented, the staying capacity also not high. When applied over a good primer or base it stays for around 5 hours on my lids which is not great though. I will share an eye makeup look using this palette really soon.. Actually I have created one look ,but couldn't take quality pictures because of the cloudy weather outside..